(NaturalNews) Just when you thought that the health benefits of blueberries couldn't be any more plentiful, new research has found that freezing the superfood actually increases the berry's nutritional content. Graduate student Marin Plumb, a food science major at South Dakota State University, found that frozen blueberries are equally nutritious as fresh blueberries, even after six months of freezing. Plumb's experiment involved observing antioxidant levels in blueberries frozen for one, three and five months. After comparing the antioxidant content of frozen berries to fresh berries, she found no decrease in the nutritional value of the frozen berries. In fact, Plumb noted that freezing actually increased the anthocyanin concentration. "The ice crystals that form during freezing disrupt the structure of the plant tissue, making the anthocyanins more available," Plumb explained. Anthocyanins are a group of antioxidant compounds that provide various systems in the human body with protection. "Blueberries go head to head with strawberries and pomegranates in antioxidant capacity," said Plumb's research adviser, professor Basil Dalaly, who teaches a course on phytochemicals, the naturally occurring chemical compounds in fruits and vegetables. When it comes to eating healthy foods, "the greener or redder, the better," added Dalaly. It's no coincidence that people associate bright color with nutrition. Anthocyanin, which works wonders in our bodies, is also the colorful pigment that gives many foods their color. Don't believe industry studies that claim organic food is equal in nutrition to conventional; it's simply not true. A study directly compared the total antioxidant capacity of organically grown versus non-organically grown blueberries and found that the organic blueberries had significantly higher concentrations of phenol antioxidants and total anthocyanin antioxidants than conventional berries. Improving memory/motor function - One study found that older adults (average age 76) fed blueberries daily for 12 weeks (2-2.5 cups per day) performed better on two different cognitive function tests, which included memory, than those who hadn't consumed the superfood. Eye protection - Blueberries have been proven to protect the retina from unwanted sunlight and oxygen damage. Heart - Consuming blueberries significantly lowers your risk of developing heart disease by regulating and relaxing arterial elasticity in the vascular wall. They also improve blood flow. Reduces risk of Alzheimer's disease/dementia - Anthocyanin improves memory and mental fluidity, and can help protect against brain cell loss. Blueberries also stimulate nerve cell growth and facilitate better communication between nerve cell processes, in turn slowing the aging process. Digestion - Blueberries offer antioxidant protection of the digestive tract by combating free radicals, some of which can cause cancer. This superfood plays a significant role in combating colon cancer. Protection from toxic heavy metals - Romanian chemists from the University of Bucharest discovered that blueberries protect against heavy metals. Blueberry extract created a force field that acted as a barrier against cadmium, protecting cells from toxic heavy metal damage. Blood sugar - Blueberries have a favorable impact on blood sugar, even for diabetics. Those who consumed at least three servings of blueberries a day saw significant improvement in their regulation of blood sugar. Nervous system - Blueberries contain a range of different antioxidants, all of which are beneficial to the human body. This range of nutrients provides nerve cells with protection from oxygen damage. Nerve cells are persistently at risk for oxygen damage, thus requiring continuous protection. Blueberries are one of our body's greatest allies. Their ability to eliminate free radicals protects us from every day exposure to various forms of pollution, including pesticides, sun exposure and heavy metals. 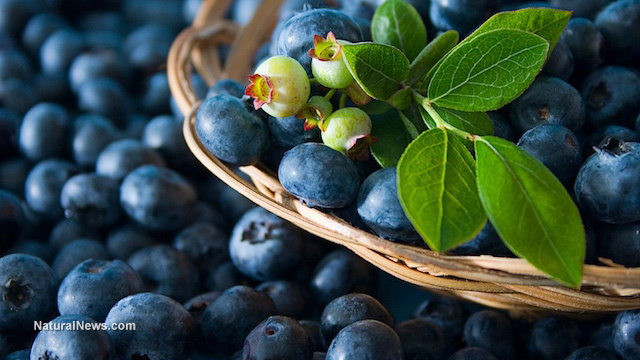 The United States is responsible for the world's supply of blueberries, growing 84 percent of the superfood in 2012.